The first and most widely planted tree species inoculated with French black truffles. 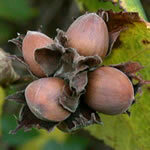 Hazelnuts are small, easy to grow trees known for producing truffles in as little as three years after planting, and often to produce truffles several years earlier than oaks or other, longer lived hosts. They also produce excellent edible nuts that can be harvested along with the truffles from the same trees (see faq’s page). Among the best hosts for truffles, particularly in warmer and dryer climates. Holly oaks are beautiful evergreen live oaks common in Mediterranean Europe, and widely used to cultivate truffles in Spain. An excellent host for truffles, both in natural forests and in plantations. English oaks grow into large, deciduous trees used widely and successfully throughout the world as hosts for black and Burgundy truffles. Please contact us for other tree species, trees inoculated with Burgundy truffles (Tuber aestivum) Italian white truffles (Tuber magnatum), bianchetto truffles (Tuber borchii), and pecan truffles (Tuber lyonii). We are also experimenting with inoculation methodologies for several other truffle species, including the four native Oregon truffles. Please contact us for availability. New World Truffieres is now taking orders for inoculated truffle trees. Trees ordered now will be shipped between mid-December, and the end of February (with some exceptions). Call (541) 636-0900, or email us to place orders. We recommend that growers considering larger scale commercial truffle farming operations contact us to start what is often a long site evaluation and planning process. Please call or email for pricing. We specialize in larger commercial orchards, but are willing to sell as few as 50 trees.